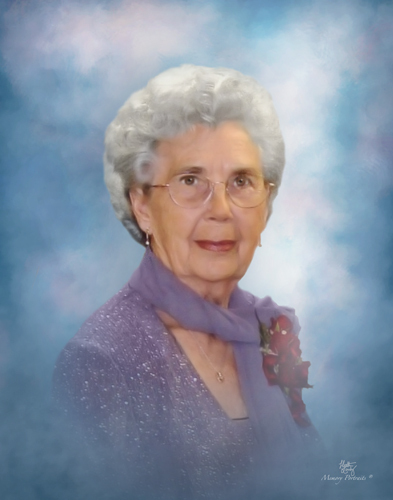 Mrs. Lois Ellen Johnson, 95, of Greensboro passed away Friday, January 18, 2019 at her residence. The family will receive friends Tuesday, January 22, 2019 from 12:00-1:30 pm at Sedgefield Presbyterian Church with a funeral service to follow at Guilford Memorial Park Mausoleum Chapel with Rev. Kim Priddy officiating. Lois was born April 1, 1923 in Bailey, NC to the late George William and Ellen Straughn Johnson. In addition to her parents, she was preceded in death by her husband Ivan V. Johnson. Survivors include a son, Gordon Johnson (Ruby) of Stokesdale; a daughter, Tricia Jackson (Dean) of Climax; 2 grandchildren, Tracy Britt (Jason) and Chris Jackson (Allison); and 3 great grandchildren. In lieu of flowers, memorial contributions may be made to Sedgefield Presbyterian Church, 4216 Wayne Road, Greensboro, NC 27407. George Brothers Funeral Service is assisting the Johnson family with funeral arrangements.